The public continues to express positive views of many agencies of the federal government, even though overall trust in government is near historic lows. Large majorities express favorable views of such government agencies as the Centers for Disease Control and Prevention (CDC), NASA and the Defense Department. The latest national survey by the Pew Research Center, conducted Jan. 7-11 among 1,504 adults, finds that 70% have a favorable view of the CDC, which came under criticism last fall for its handling of the outbreak of the Ebola virus. Nearly as many (68%) have a favorable view of NASA, and 65% hold a favorable view of the Department of Defense. While overall favorable ratings for most of the agencies tested have changed little over time, there has been a sharp decline in positive views of the Department of Veterans Affairs (VA). Currently, 52% have a favorable view of the VA, down 16 points since October 2013. The agency has been widely faulted for delays in health care for veterans; the scandal led to the ouster last year of VA Secretary Eric Shinseki. As tax season begins, the public expresses mixed views of the Internal Revenue Service: 45% have a favorable opinion of the tax agency while 48% have an unfavorable view. Opinions of the IRS are little changed from October 2013. The survey finds wide partisan divides in views of many government agencies. Republicans hold less favorable views than Democrats of five of the eight federal agencies included in the survey. 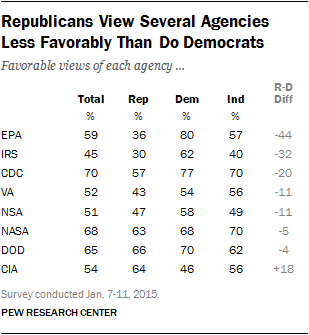 The CIA is the only agency included that Republicans view more favorably than Democrats. Fewer than half as many Republicans (36%) as Democrats (80%) have a favorable view of the Environmental Protection Agency (EPA). Republicans also offer less favorable ratings than Democrats of the IRS (32 points), CDC (20 points), VA (11 points) and NSA (11 points). By contrast, Democrats are 18 points less likely than Republicans to view the CIA favorably (46% vs. 64%). Partisan differences have increased in opinions about both the EPA and the CIA. In February 2014, Republicans had mixed views of the EPA: Nearly as many had a favorable view of the agency (45%) as an unfavorable opinion (46%). 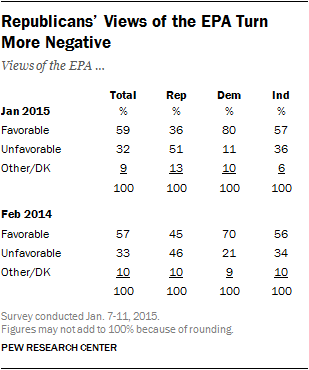 Today, 51% of Republicans have an unfavorable impression of the EPA, while just 36% view it favorably. Democrats’ views of the EPA have become somewhat more positive over the past year (80% currently, 70% in February 2014). Democrats’ views of the CIA are more negative today than they were five years ago. In March 2010, there were only modest differences in opinions about the CIA among Democrats (55% favorable) and Republicans (61% favorable). 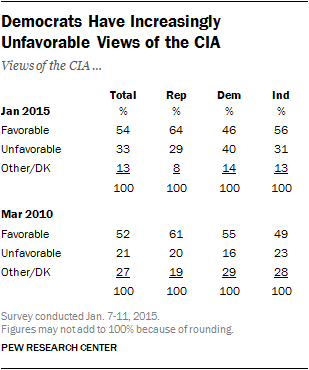 But today, 46% of Democrats view the CIA favorably, while 40% have an unfavorable impression. More Democrats offer an opinion of the agency today than in 2010; unfavorable views have risen 24 points since then (from 16% to 40%), while favorable views have shown less change. Opinions of the CIA among Republicans are little changed since 2010. Over the course of the past year, views of the Department of Veterans Affairs have declined across the board. In the current survey, 52% express a favorable view of the VA, compared with 38% who hold an unfavorable view. In October 2013, more than twice as many held a favorable (68%) as unfavorable (25%) view of the VA. Favorable ratings of the VA are down 23 points among Republicans (66% to 43%) and 20 points among Democrats (74% to 54%) since October 2013. College graduates view the VA much less favorably than they did in October 2013. Favorable ratings of the VA are down 29 points among college graduates from 75% to 46%. The declines have been more modest among those with some college experience (eight points) and those with no more than a high school diploma (15 points). The IRS is the lowest rated federal agency included in the survey. Overall, 45% hold a favorable view of the IRS, while about as many (48%) say they have an unfavorable view of the agency. Attitudes toward the IRS have changed little over the past several years. Partisan differences in views of the IRS are stark. Republicans, by about two-to-one (64% to 30%) have an unfavorable opinion of the IRS. Democrats, by about the same margin (62% to 32%) view it favorably. Among independents, 40% have a favorable view of the IRS, while 55% have an unfavorable impression. Republicans and Republican leaners who agree with the Tea Party hold especially negative views of the IRS. Just 15% of Tea Party Republicans have a favorable view of the IRS compared with 82% who have an unfavorable view. Among Republicans who do not agree with the Tea Party, 37% view the IRS favorably, while 58% view it unfavorably. There are only modest differences in views of the IRS across income levels. Favorable ratings of the IRS are similar among those in households earning $75,000 a year or more (45%), $30,000-$75,000 (43%) and less than $30,000 a year (49%). Favorability ratings for the National Security Agency (NSA) have changed little since the fall of 2013, shortly after former NSA analyst Edward Snowden’s revelations of the agency’s data-mining activities. About half (51%) view the NSA favorably, compared with 37% who have an unfavorable view. Young people are more likely than older Americans to view the intelligence agency positively. About six-in-ten (61%) of those under 30 view the NSA favorably, compared with 40% of those 65 and older. Adults with a post-graduate degree have mixed views of the NSA (45% favorable vs. 43% unfavorable). Among those with less education, favorable opinions of the NSA outnumber unfavorable views.